Little Leaf Copy Editing pairs up professional copy editing and expert consulting services to give you the most personalized writing assistance. For over ten years, Katie has used her writing skills professionally. She has reviewed grant proposals, edited theses and dissertations, taught college-level composition classes, assessed writing samples for job candidates, tutored students of all ages, and written content for websites and promotional materials. She has a Master of Arts in English from South Dakota State University and a Master of Fine Arts in Fiction Writing from Southern New Hampshire University. She is currently working on her first novel for publication. 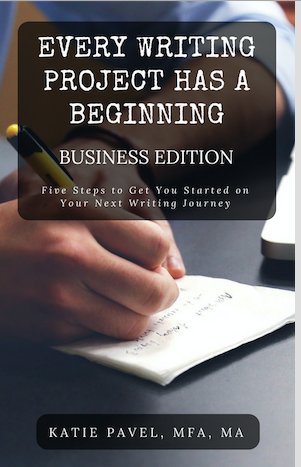 Whether your niche is academic writing, business writing, or creative writing, Every Writing Project Has a Beginning offers five action-related steps you can use to start your next writing project and get the most out of your writing time. Subscribe to Katie's mailing list and get this e-book (all three editions) delivered right to your inbox! Katie is a true literature lover—her ideal days are spent writing and snuggling with her pups, Darcy and Emma. She is invigorated by seeing projects come to fruition.